A few weekends ago my brother and sister-in-law came up from Melbourne for a weekend visit. It was the first time they’d been up since W was born and it was especially lovely to watch them play and laugh with her. We didn’t do much – went to the market, cooked good food, ate good food, talked. My kind of weekend. On the Saturday we spent most of the morning on the front verandah. S cooked us all up homemade baked beans and freshly brewed coffee and we lazed in the warm mid-winter sun. Having been up here in Brisbane for almost four years now, I’d forgotten what an incredible luxury hot sunshine in June actually is. The other amazing thing about living in the sub-tropics is that pineapples and strawberries and sugar bananas are in season almost all year round! Pineapples are my obsession. At the moment we get these mini ones at the market that are grown in the Glasshouse Mountains – four for $5. They are sweet and juicy and SO UNBELIEVABLY DELICIOUS. S isn’t a huge rap for pineapples, so I pretty much gorge on them all by myself, all week. This one time, I ate so much pineapple in one sitting it made my cheeks sweat. I have no regrets. 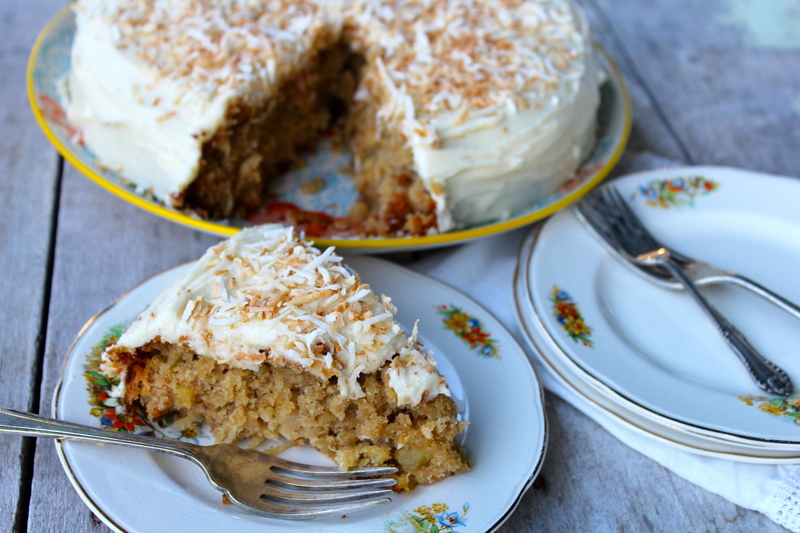 It was actually my brother’s idea to bake something that included both pineapple and coconut. I hadn’t intended to make this cake, but once the idea got into my head I couldn’t quite shake it. Plus, who can resist something with a name as lovely as hummingbird. 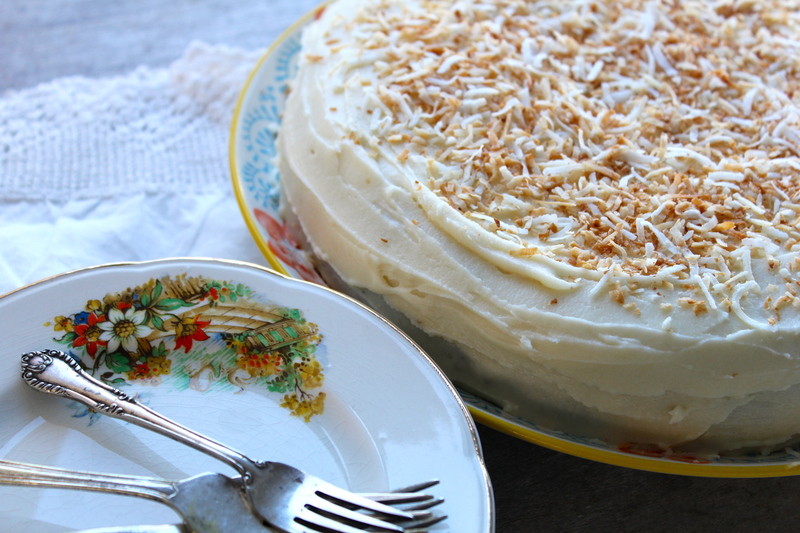 Hummingbird cake is pretty much the tropics in cake form. Pineapple – check. Coconut – check. Banana – check. It’s wonderfully moist and fruity, and the frosting gives it a touch of decadence. It is definitely best the day it is baked, but will happily keep for two or three days, covered on the bench or in the fridge. It’s easy to make and trust me, you will love it. Bake it in the morning, and share it with family over a cup of tea in the afternoon. Perfect. Heat oven to 180°c. Grease and flour a round springform pan. Dry toast the coconut in a pan over medium heat, tossing continually until it starts to brown, about three or four minutes. Once it starts to colour remove from the heat and set aside. In a medium sized bowl, sift together the flour, baking powder, bi-carb soda, and salt. In a larger mixing bowl mash the ripe bananas with a fork. Add the two eggs and beat into the bananas along with the sugar, vanilla essence, and coconut oil. Peel the pineapple and finely chop, reserving the juices. Add the whole lot to the wet mixture and combine. Add the dry ingredients to the wet and stir through, taking care not to overmix. 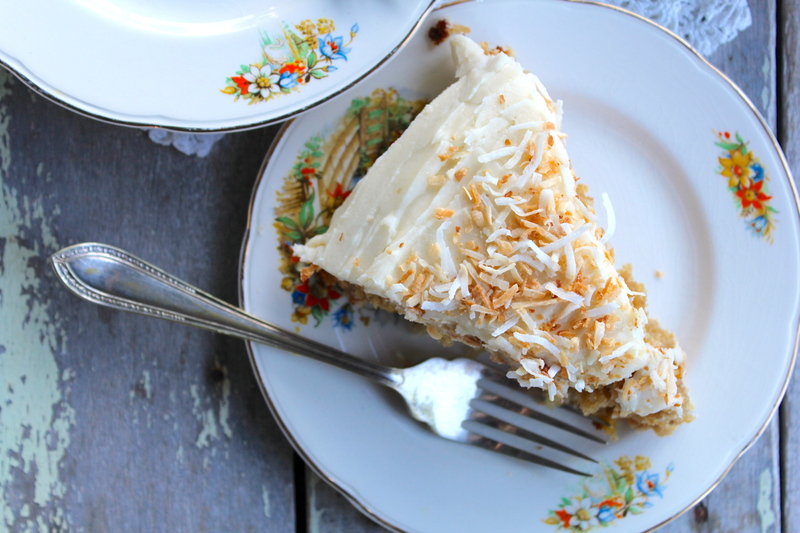 Add ¾ cup of the toasted coconut, mix through, and pour into the prepared pan. Bake in the preheated oven for about 60 minutes, or until a skewer inserted in the centre comes out clean. Leave the cake in the pan for about thirty minutes, then turn out to cool. Prepare the frosting by creaming the butter. Add the icing sugar one cup at a time alternating with coconut milk. Whisk until the frosting is smooth and glossy – if it is too runny, pop it in the fridge for an hour or so. 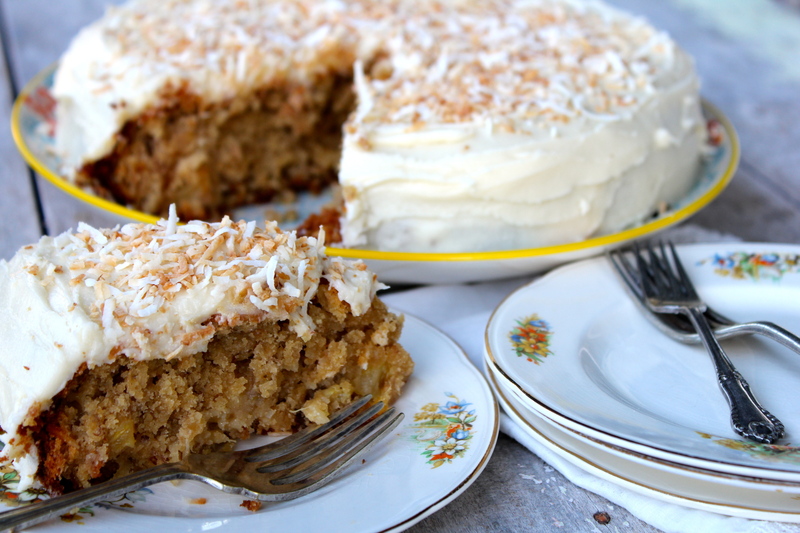 Once the cake is cooled completely, frost the top and sides using a butter knife and decorate with the remaining toasted coconut. Enjoy! 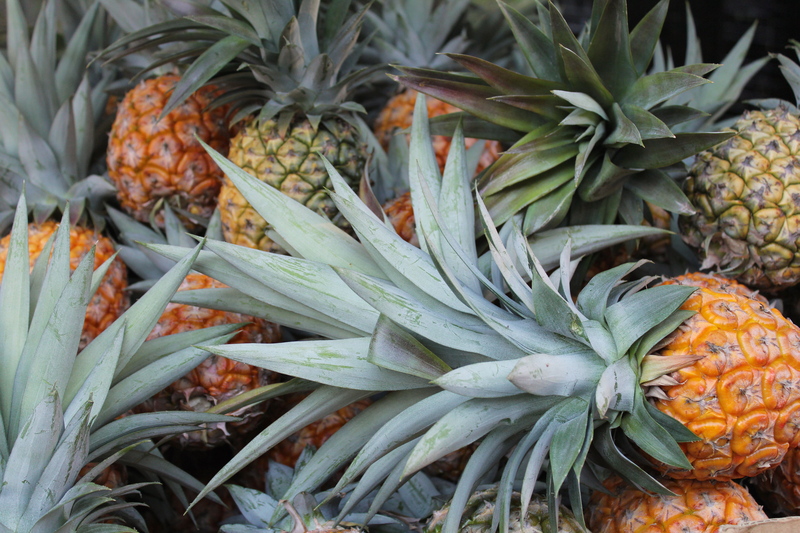 Notes: choose pineapples that are sweet and juicy, keeping in mind that pineapples don’t ripen once picked. To make sure you choose a ripe pineapple check that it smells sweet but not sickly or fermented, that it is firm, and that the colour is golden (although a bit of green is totally fine).